The topic of corporate values is an interesting one; it enables an external person to get a sense of the common denominator connecting those working under the ANTAL company umbrella. It is natural occurrence made possible when like minded individuals work together with common goals. 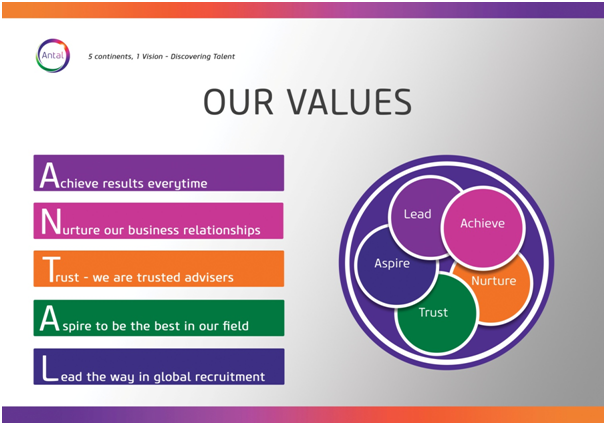 Each person working in the Network is aligned to these values and is working together. A practical and prime example of the ANTAL values in action is the daily conference calls where as many as 12 offices from all corners of the globe discuss business development and key clients in their niche markets. This open sharing of information and business enables the offices to use each other’s strengthens and so achieves results. The call fosters business relationships whilst developing trust between offices and also our external clients. Everyone with Antal is aligned to a cycle of learning and improvement, on the daily calls we also share best practice enabling us to learn from each other. Our quest for continuous improvement and to be a leader in the world of global recruitment is indeed our common goal. The Antal values impact each person within the organisation, Anisa Begum, our Franchise Sales Administrator follows the Antal values in her daily work and says, “Values are the foundation of my decisions, actions and behaviour, The Antal values help us achieve our goals while working together on a global scale”. Antal International Network operates a franchise system which allows investors to join our organisation and set up their very own Antal offices internationally. Contact the team on franchise@antal.com for more information on how you can be part of our expanding network and align yourself with our values.